I consign with Duck-Duck-Goose in another city. Can I use my same number and consign in Waynesville? We have many charities receive donations as a result of our sale. We try to meet a variety of needs. Last season there were many organizations that benefited from your giving. Please email play@dkdkgoose.com with questions or schedule changes. Can a friend who is not consigning shop with me during the Private Sale? There are two ways your non-consigning friend can shop with you during the Private Sale. He or she can work the appropriate number of shifts to qualify for that particular time you are shopping or consign at least 30 acceptable items in this sale. We issue one Private Sale wristband per consignor and everyone who wants to shop on this day must have a wristband. I want to be one of the first shoppers on the Private Sale day, but 4 hours is all I have… any suggestions? Make it a date! We have several moms and dads that work one or two shifts together. They have grandma watch the kids and they work one or two 4-hour shifts together, go to dinner and there you have it a Duck-Duck-Goose date night! This block of time is instantly doubled when you bring-your-spouse-to-work with you! Working a total of four shifts let’s you shop the earliest on the Private Sale day. To shop the absolute earliest, add just one sorting shift to your four shifts and you can shop the night before the Private Sale. Although you are not required to work to participate in our event, our event cannot run smoothly without you. We need to fill over 300 shifts. 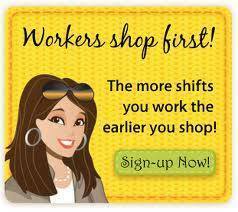 The more shifts you work, the earlier you get to shop! And did we mention… it’s alot of FUN!! !